USB port, D port. AC power cable included. Comes pre-installed with Windows 7 professional. Includes only base unit (excludes keyboard, mouse or monitor provided). 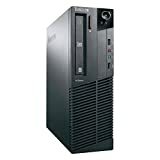 This entry was posted in Desktop Computers and tagged Core, Intel, Lenovo, ThinkCentre, Windows by Computer Education World. Bookmark the permalink.